Review: Addicting. Dazzling. 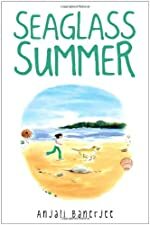 A great ambition from cover to cover, Anjali Banerjee’s Seaglass Summer is an extremely well done book of a girl that faces a challenging decision that will change her life forever. This girl, named Poppy Ray, will think over and over about those kinds of decisions and discover what sacrifices have to be made in order to achieve her ambition. Throughout her entire life, Poppy Ray dreams of being a vet just like her uncle Sanjay. Her mother however, is extremely allergic to animals with fur, making it impossible for Poppy to even get a good childhood experience with animals. This is why Poppy is overjoyed when she is invited to go over to her uncle’s house for a few weeks in the summer. Poppy wants to learn all about helping animals and actually do some of the work. Then Poppy discovers what true work and dedication it takes to be a veterinarian. But things soon seem to be harder than Poppy imagined. Will Poppy get past the flaws of being a vet such as the blood, the deaths and the most of all “plain gross stuff” or will she give up the dream that she has had for so long? Seaglass Summer is a terrific book of a story that any young person can go through in their lifetime. I enjoyed the book because of the struggles that Poppy went through such as some deaths and wounds. On a scale of five stars, I give it the full five for that very reason. I recommend this book to the ages of 7 to 14 because of its connecting story to younger readers. All in all, I thought the book was beyond beautifully written. I would not be surprised if it was nominated next year to the Rebecca Caudill young reader’s book list. If it does, I believe it has a great chance of actually winning the award. This book was the first that I have ever heard of Anjali Banerjee, but I’m sure it will not be the last. Seaglass Summer has made me stop to think about my future and my dreams. I believe that books that can do that to a person are beyond ordinary. We would like to thank Random House for providing a copy of Seaglass Summer for this review. Have you read Seaglass Summer? How would you rate it? Brandon, thank you for this wonderful review of my book. This is why I write - for readers like you.